Whether it’s a conference, interview, meeting, focus group, or other event to be transcribed, we at Accentance have refined a system to keep your quality high, your turnaround quick, and your costs low. We provide another bonus: Throughout your transcript we include timestamps/timecodes. That enables you to quickly find the location in the audio that corresponds to the location in the transcript, if you so desire. Of course, you have the option to exclude them as well. Typical turnaround time for small projects (up to 1.5 hours, two or fewer speakers) is two working days; larger projects are typically three days to a week, depending on size. For an added fee a one-day rush service is available. Transcripts are delivered to you via e-mail or via a shared Dropbox folder, in Word format. The process is simple. Upload your audio file(s) here. Fill in your contact information so that we can e-mail the transcript back to you ASAP. We’ll invoice you, and you can send a check or pay online via credit card or PayPal. Another convenient option is to have us create a shared Dropbox folder for you, which is particularly useful when you have a lot of audio files at the same time. That way you can copy your audio files to that folder, and we’ll place the finished transcripts there, with auto-notifications sent out via e-mail. You also can e-mail us links to webcasts. If your recording is not in an uploadable format such as CD, DVD, audiotape (including microcassette or reel to reel) or videotape, send us your recording via regular mail. In that case, please include this order form. Also keep a copy of the media. Note: If you do not desire timestamps, please let us know beforehand. To view a sample transcript, click here. For details on the styles and formats that we use in our transcripts, i.e. how we deal with labeling speakers, inaudible words, superfluous words, grammar errors, etc., click here. Feel free to have us customize styles and formats to fit your needs. We can handle large transcription projects involving many hours of audio. To speed turnaround time, rather than assigning an entire large project to one or two transcriptionists, we distribute the project among many transcriptionists. That way, for a project consisting of, say, 20 or 30 hours of audio, we usually can deliver the finished transcripts to you within one to two weeks. 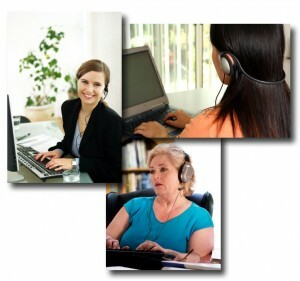 Many transcription companies outsource to India or other foreign locations. Not us. Unless they grew up in or spent many years in North America, the vast majority of foreign transcriptionists often cannot understand certain accents, slang, references to popular culture, and other nuances in North American English. So for North American speakers, we therefore only use transcriptionists who are very familiar with North American English, which in most cases means they grew up here. In addition to audio or speaking quality, accuracy could depend on the extent to which industry-specific words, esoteric words, and/or unique names are used, with which the transcriptionist may not be familiar. Keep in mind that our transcripts include the timestamp every minute or so, enabling you to easily verify with the original audio what was said. If your recording contains many technical terms or unique names, we recommend providing us with a list of them beforehand. A list of people’s names can be highly useful as well. We can’t emphasize this enough: when recording, place the recorder or the microphone as close to the speaker as is humanly possible. And record in a room without background noise, if possible. More often than not, audio quality is poor because the microphone is too far away from the speaker(s) and/or because of background noise. That results in a less-accurate transcript, and a higher cost for you due to the extra time involved in transcribing. The quality of the recorder makes a big difference as well. Newer-model smartphones generally have good recording quality. Older-model smartphones generally produce low-quality audio so avoid those if possible unless talking directly into the microphone. Standard digital handheld recorders are OK, although certain recorders are better than others in terms of audio quality. Another excellent recording device is a laptop or iPad with a built-in or USB microphone. You’ll need recording software if it’s a laptop; a good one is www.polderbits.com. For handheld recorders, we recommend the Olympus WS-110 WMA Digital Voice Recorder, or the WS-210S, widely available online and perhaps at your local Radio Shack. Always have a back-up recorder. With digital recorders, it can be easy to think you’re recording when in fact you aren’t. If there are two or more people the best arrangement is to attach a clip-on (also known as lapel or lavelier) microphone to each person – particularly if you’re using a lower-quality standard digital recorder. Clip-on mics are available at Radio Shack or online; you’ll also need a small adapter to turn one microphone input into two inputs – known as Y-splitters, also available at Radio Shack. If you’re recording a phone conversation and the line connection is not good, don’t hesitate to tell the person with whom you’re speaking that you’ll hang up and call back in an effort to get a better connection. Or ask the speaker to switch phones, if that is the problem. If he or she is using a speakerphone, resulting in poor audio, if feasible you should ask him or her to use the receiver instead. As mentioned above, you can send us via postal mail DVDs, CDs, cassettes, reel-to-reel tapes, and videotapes (please include this order form). Not only will we send you back the original recording, but along with your transcript(s) we will e-mail you the digitized version of the recording (e.g., MP3 or WAV), enabling you to take advantage of the timestamps by listening to it on your computer using standard software such as Windows Media Player. This also creates multiple backups of your recordings. While we will make every effort to ensure that transcriptions are as accurate as possible, we cannot ensure 100 percent accuracy. Therefore, to ensure accuracy, for important passages always play the audio file and listen to the quote yourself to verify what was said. We will not be held responsible or liable for any misquote, damages, or other problems, financial or otherwise, that occurs as a result of a transcript inaccuracy or inaccuracies. Nationwide and worldwide service. Also serving Washington, D.C., northern Virginia and suburban Maryland including Chantilly, Fairfax, Arlington, McLean, Reston, Centreville, Alexandria, Falls Church, Vienna, Leesburg, Bethesda, Potomac, Gaithersburg, Germantown, Rockville, Annapolis, Silver Spring, and other locales.